MQA hands-on hands on review | What Hi-Fi? MQA audio had its first public demo at CES 2016, and we've had a listen to the high-resolution format on a number of devices. Here are our first impressions. First up was the Pioneer XDP-100R - a £500 hi-res player that claimed the title of the world's first MQA-ready player. Our review sample of the Pioneer player isn't ready to support MQA yet (a firmware update will fix this in early 2016), so this was the first time we'd heard MQA files on the device. We're still waiting on the MQA to be officially available on streaming services, and so we content ourselves with downloaded files. An MQA file of Lady Gaga and Tony Bennett's Cheek to Cheek sounds loud, clear and with the kind of solid detail that hi-res can deliver. The MQA logo is clearly displayed during playback. Once the firmware update comes through, we'll be sure to report back about how MQA audio compares with rival sound formats on the XDP-100R. If you want to listen to MQA on something that's a bit more accessible, HTC has offered its One A9 smartphone as a prototype, with MQA technology running on it as a 'proof of concept' at this stage. There were a selection of songs - all clearly labelled as MQA - available for listening, with playback running smoothly. Once again, it's hard to judge sound quality when there are thousands of people talking in the background, but we're eager to hear more if the concept becomes a reality. The current One A9 models won't be able to play MQA just yet, though. MQA and HTC are in talks about how they will implement MQA support in the One A9, but being able to stream or download hi-res files that take up less space than current formats would be fantastic for those that want better quality music on their smartphones without chewing through their data allowance. And lastly, we heard MQA files streamed via Tidal. While we were all hoping for an official launch at CES 2016, it seems the Tidal/MQA partnership has once again been delayed. On the plus side, we did get to experience how MQA streaming will work on Tidal. 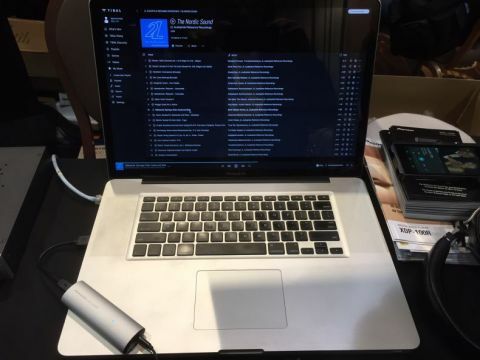 The demo was run on a MacBook Pro laptop through the MQA-enabled Meridian Explorer DAC 2, with music files supplied by Scandinavian label 2L (who will be the first music label to offer MQA downloads for sale). The streaming was smooth and uninterrupted, with classical pieces sounding well-rounded, detailed and dynamic. Once the Tidal/MQA launch happens - which we hope is sometime soon in 2016 - we'll put the service through the full review process. Half the battle when it comes to new formats or technologies is getting support from key manufacturers in order to get the necessary hardware. With MQA, that looks to be happening slowly but surely. The proof of concept of the above products is another step in the right direction, and towards making hi-res audio a more realistic proposition for the average music consumer. The necessary content needs to follow, at which point we look forward to seeing hi-res streaming make a meaningful impression on the market.